Our mascot will visit your party to sing Happy Birthday. Our mascot will visit your party to sing Happy Birthday! Party Hostess to serve your party. 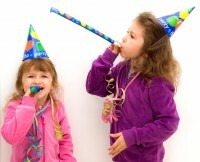 Add More Fun to your basic party package! Spongebob, Hello Kitty, or Dora The Explorer!